I was first acquainted with Hob at PAX 2015 when we sat down with Marshall Lefler. Since then we've had a couple other opportunities to play the game as it progressed, with our last opportunity just a few weeks ago at Runic's studio in Seattle. From the first minute we got our hands on the game, we have been enchanted by the game's visual style and mysterious, open world. If you are a fan of Ico or The Legend of Zelda, you'll find plenty to love about Hob. Hob's visuals are the first thing that really stands out in the game. There is a beauty and clarity to the world that I can't quite describe. It reminds me of a studio Ghibli film. There is a careful, handcrafted feel to the characters and environment that I wish I could find in more games. From the lush forest areas with their strange and charming fauna, to the dark, mechanical steam-works beneath the surface, Hob oozes with atmosphere. It is immediately a world that I want to explore and learn more about. The world of Hob is itself the game's greatest puzzle. Every area of the game is at some point in the game completely rearranged to open up new areas to explore and change. When I say that areas are rearranged, I mean it in a very literal way. Huge blocks of the world will rise or fall and shift in all sorts of ways to assemble new paths. It's amazing to look at, and even more amazing when you consider how much sense the world really makes. It is strange that for as ephemeral as some of the game areas are that I never felt as though I was lost. 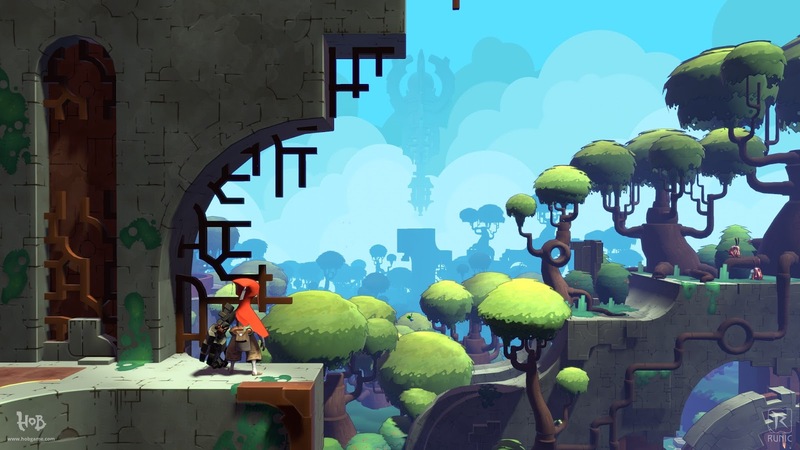 Hob accomplishes a lot without directly speaking to the player at all. The most direct communication I received was the occasional prompt the press a specific button on my controller, and even those were infrequent. By leaving dialogue out of the game entirely, Hob forces players to explore the environment and look for signs or any other hint at where the path to the next objective lies. Before long, I found myself able to read the environment for the clues I needed rather than needing to rely on dialogue or tooltips that could break the immersion of the game. Scattered throughout the world are locations that gives the player a chance to take in the sights. In these places, the character will sit down or lean against a wall as the camera pulls out or pans a bit to reveal more of the beautiful environments. At one point I spent a solid ten minutes parked in one place watching the sprites and frog-birds jump around and play. 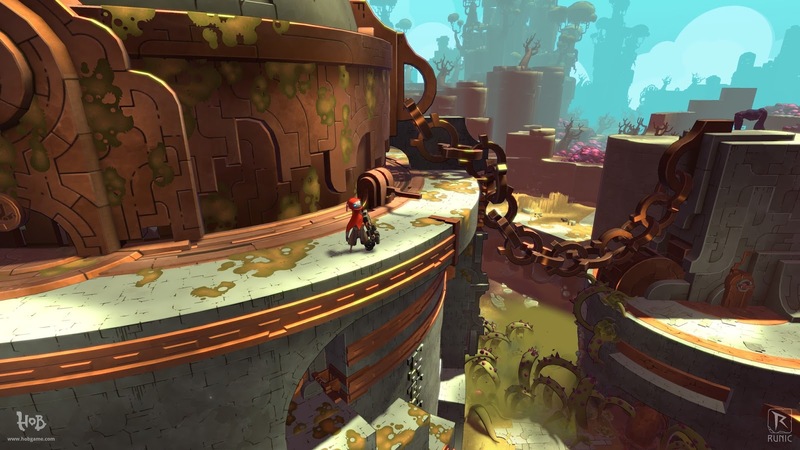 The audio in Hob is just as deserving of praise as the visuals and the narrative style. The moving bits of machinery clank and thud with the kind of noise one would expect from multi-ton slabs of rock and brass slotting into place in the landscape. The steampunk Ico motif, as good as it looks, would not have been pulled off nearly as well if it were not for the beautiful sound design. The environments themselves too sound fantastic. The hum of life in the forest areas, the chirps of the sprites and the hollow echo of the underground create vibrant soundscapes that heighten the effect of the visuals. It is nothing short of magical. The music, by Matt Uelmen is not often heard during the gameplay, which is understandable, given the exploratory nature of the game; The player is supposed to be focused on the environment, and a loud, bombastic soundtrack can detract from that attention. Uelmen's soundtrack to the game is quiet, but in the moments that it does come through, it feels like a part of the environment, carried in on the wind or through the pipes from some distant spot in the world. The actual gameplay is highly engaging, with varied pace between exploration, active puzzle solving and combat. The enemies fight in interesting ways that force me to make use of all of my abilities. Some of the giants have leg armor that I have to detach before I can deal damage, still others wear rocky plate armor that can only be removed with a powered up punch from the character's Hellboy-esque mechanical arm. The controls are very responsive, providing instant feedback during combat. My only issue so far has been that I can apparently roll directly off of cliffs and need to be more careful about when and where I decide to roll away from an attack. As much as I enjoy the combat, it is not a very heavy part of the game. Hob fills out its paths with puzzles rather than enemies, and they are some of the more interestingly set up I have seen in recent memory. None of the puzzles I have encountered feature any contrived solutions. Every one requires careful manipulation of machinery, the environment or both in ways that fit both mechanically (no pun intended) and thematically. 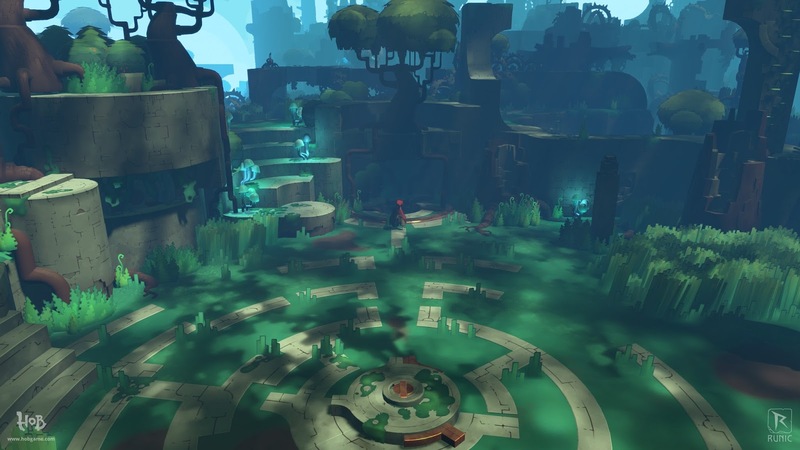 As such, Hob's puzzles are more intuitive, but still fiendish where they need to be. In the end, I am so happy to finally get the chance to play Hob in its entirety. The mystery of the world and its inhabitants have intrigued me since the first time I laid eyes on the game. It is a beautiful, meditative journey through a vivid and exciting world that is begging to be explored. I highly recommend you pick up a copy as soon as possible. Hob is available on Steam and PS4. Our review was written playing both the PS4 and PC versions.